On January 21, 1948, an Eastern Airlines Constellation crashed while attempting to land at Logan Airport. 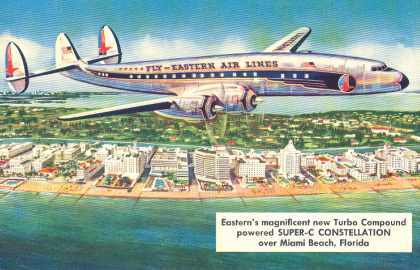 Twenty-five people escaped the aircraft, aided by a tremendous effort of the Eastern Airlines crew. Fourteen passengers were injured, with two seriously hurt. The flight had originated in Miami, and was turned away by LaGuardia Field in New York due to bad weather. It appears the aircraft had approach system problems, and an Air Traffic Controller at LaGuardia had offered to "talk him down" [to relay ground radar information to the pilot]. At Boston, the weather was also terrible, with a low 600 foot ceiling. The aircraft landed at about 130 mph, and slowed to 100 mph. Suddenly the plane skidded to the right, crashed, and one of the outboard motors burst into flames. An alert Eastern Airlines crew assisted passengers in removing their seatbelts, and in debarking the plane. The Captain directed the passengers to leap 10 feet into a nearby snow bank, and to move away from the burning aircraft. The Captain was the last person to jump to safety, and moments later, the plane exploded and split in half. Forensic accident investigation was less developed at the time, and the cause of the accident was likely due to multiple reasons (weather, mechanical failure, pilot decisions, or icy runway conditions).